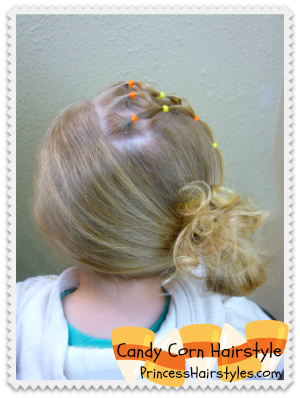 An "Elastic Web" Hairstyle Inspired By Candy Corn! Cute Hair Style For Halloween, Thanksgiving, & Fall In General. Some of you may remember the "candy corn style" we posted several years ago on our Princess? This has been one of our all time favorite hairstyles for Fall and I feel bad that we never made a video tutorial. So, this is a remake for all of our YouTubers. This hairstyle is great because it works with short hair, thin hair, thick hair, medium hair, and of course, long hair. Pretty much any hair texture or length (and as you can see, even toddler hair.) This is also a very easy hairstyle to complete with no braiding skills required! (Be sure to watch the end of this video for a fun clip of "The Pea!" I realize that many of our Halloween hair ideas are fun, but might be considered rather obnoxious for certain occasions (for example the spider bun!) But, I think this candy corn style is subtle enough that it could look nice even for church or school. 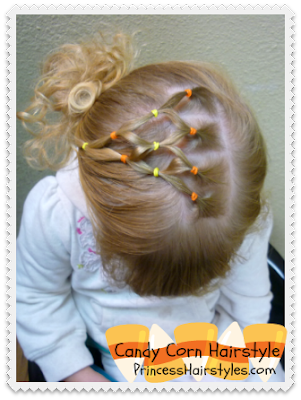 Most people would probably not even realize it is supposed to be a candy corn and just think it is a cute hairstyle!